When you’re beginning a new design, you probably already have an image in your mind’s eye of the general look and feel you’re aiming for — it’s usually the details that have to be filled in as you go. Typically what this image shows you is a combination of the layout, some loosely formed major motifs, and the style that these are executed in. Thus, selecting the style is usually done subconsciously prior to getting down to the nitty gritty of the process. However, it’s still very important to think carefully about the details of the execution of your selected style. What are the necessary practical considerations? For the purposes of textile design, style can be broken down into two parts. Firstly, there is the medium — watercolor, colored pencil, charcoal, digital vectors, gouache, etc. This is an extremely pivotal decision in the determination of your end product. Use of different media causes the same exact sketch to convey vastly divergent tones. A detailed paisley executed in watercolor will almost inevitably feel fluid and loose, while carefully inking over the sketch with pen will result in much tighter, sharper artwork. Once you’ve decided on your medium, it’s time to address the second component of style, which is technique. Seeing that it is the most common medium for painting a textile design, let’s use gouache as our example. Gouache — or designers gouache, as it’s frequently called — is an excellent choice of medium for painting in a very flat, opaque mode. However, it can also work almost exactly like watercolor if manipulated to do so, simply by adding more water. 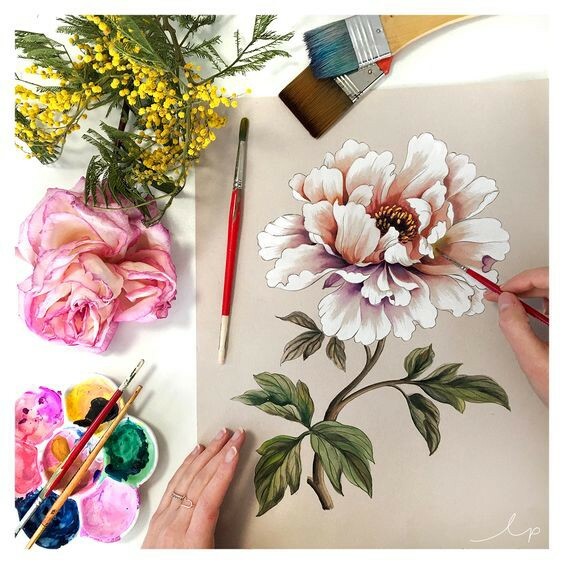 Therefore, gouache can be used to create photorealistic works, stylized graphic works, or something in between, such as a botanical illustration. Its most common use in textile design is a very flat application where modeling is created by layering a range of values on top of one another in controlled, painterly strokes that evoke shadows and highlights. This is preferred for a very practical reason: needing a limited palette that can be easily separated to create the distinct color layers required for printing. A shot from Longina Phillips Design’s studio that exemplifies a gouache technique typically used in textile design. As you can see, the technique options are endless even once you’ve selected your medium. So, what style am I going to use to execute my “Paradise Fusion” design (as I’ve decided to name it)? Due to the fact that the main premise behind the design is bringing together global interpretations on similar themes, I am going to be incorporating multiple styles. My primary motifs are going to be flowers, animals, leaves, and branches. However, within those categories, there is variation in the source material that I’ve drawn from. Some of the them are going to be much more accurate to life and painted from photographs. 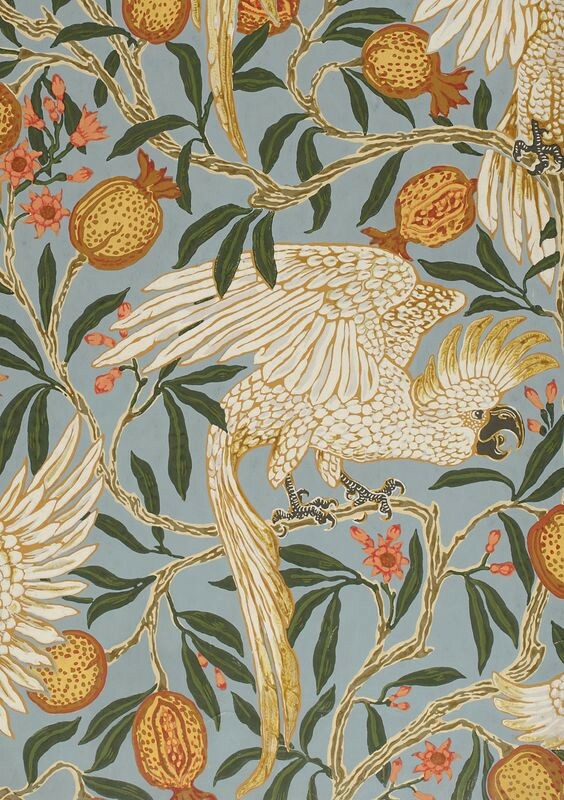 For these motifs, I am going to use a traditional style that has been widely adopted in the West under the name Chinoiserie owing to its Chinese influence, although similar styles can also be found in other cultures. What is distinctive about this technique is either the use or imitation of Chinese brush painting, which embraces both distinct outlines and smooth gradations. I am hoping that this will provide an elegant bridge between a more modeled, botanically accurate style and the flatter, more abstracted style of some of my other motifs. These motifs will be directly drawn from source material that is already stylized, and I will be painting them as such (with some tinkering), similar to the style of the Indian chintz shown above. My secondary motifs, which help to populate the ground of the design and connect the primary motifs, are going to be set back in visual space by painting them very flatly in an extremely limited palette, as demonstrated in the palampore below. A fair amount of testing will be in order to make sure that these techniques will blend together to form an attractive and cohesive style —I'm excited to get started!